About public transportation (bus, taxi, train) in Jurmala you can read here. How to get to Jurmala from Riga Airport you can find out on this page. And how to reach Jurmala from Riga city center by public transport read here. 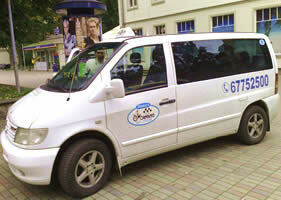 Taxi in Jurmala is very popular type of public transportation. Official taxi in Latvia must have chequered taxi plafond on the roof of car, yellow number plate with the letters "TX", taxi-counter, and printed prices on outside of passenger door. Prices for taxi service show rates for boarding in cab, price for 1km and cost of waiting. Usually, average taxi daytime rate - 1.50 LVL for boarding + about 0.50 LVL for 1 km for driving + 6 LVL/hour price for the wait. Night taxi rates are bigger then taxi prices. In spite of counter, some taxi drivers cheat and take as much money as they want. So before you go inside to doubtful taxi car better to ask how much will cost your trip, and then you may negotiate with the taxi driver for a total amount of trip or profitable price for you. You can "catch" taxi on the street, but in this case, taxi rates will be more than in case when you call a taxi by phone. When calling to taxi company by phone you do not have to pay extra money for taxi call - boarding price must be on taxi counter. There is no direct public transportation between Riga Airport and Jurmala except taxi. You may reach Jurmala from Riga Airport on buses if you firstly go from Riga Airport to Riga city center on bus Nr.22 and then make transfer and take bus or train from Riga to Jurmala. It will be cheap (more information on this page) than taxi but taxi is much faster and comfortable. Taxi goes from Riga Airport to Jurmala about 20 minutes. There are two taxi companies based In Riga Airport - Baltic Taxi and Red Cab Taxi. But you may call any taxi from above-listed taxi companies and they will pick-up you in Riga Airport. You do not have to pay extra money for taxi call by phone - boarding price must be on taxi counter. Guests of Jurmala Hotel Concordia can order (arrange) transfer from Riga Airport to Hotel Concordia in Jurmala. The price of transfer for taxi-service from Riga Airport to Jurmala is 20 euro for 1 car for max 4-5 persons. You need to order this transfer in advance (in prior). Transfer is cheap than taxi in Riga Airport. Transfer (taxi-service) from Riga Airport to Jurmala is available only for guests of Hotel Concordia in Jurmala Latvia.